As ‘the most successful tech entrepreneur you’ve never heard of’ Dame Shirley set up a pioneering all-woman software company in the 1960s, which was ultimately valued at $3 billion, making millionaires of 70 of her team members. As Caroline Criado Perez outlines in Invisible Women, men are the default and women continue to be niche. During Women’s History Month (and all year round) it’s important for us to celebrate the stories and achievements of women, which so often go forgotten. Dame Stephanie Shirley is the final March HERO in my year-long #FeminstFactFriday series. She follows profiles on Everyday Sexism Founder Laura Bates; WPP Country Manager Karen Blackett; Salesforce CEO Marc Benioff and law-changer Gina Martin. It’s fitting that a woman who so understood the power of working mothers is the HERO I’m featuring just before Mother’s Day. I first heard of Dame Shirley in 2015 following the promotion of her intriguingly-titled TED Talk Why do ambitious women have flat heads? And her story is absolutely fascinating. When I wrote my memoir, the publishers were really confused. Was it about me as a child refugee, or as a woman who set up a high-tech software company back in the 1960s, one that went public and eventually employed over 8,500 people? Or was it as a mother of an autistic child? Or as a philanthropist that’s now given away serious money? Well, it turns out, I’m all of these. So let me tell you my story. I’d recommend you watch the talk (it’s only 13 minutes long) because she’s such an incredibly interesting person, but also because of what she achieved during the 1960s and throughout her life. And because that way you’ll find out why ambitious women have flat heads. Why is Dame Shirley important? Dame Shirley created an incredibly progressive and very successful company at a time when very few people thought like she did. This was a period where only married women could get their hands on the pill, fewer than one in 100 adults cohabited (nowadays it’s one in six), ** women needed a man’s permission to get a credit card *** and women could be legally raped by their husbands. It wasn’t until the 1970 Equal Pay Act that it was finally made illegal to pay women lower rates than men for the same work. Let me take you back to the early 1960s. To get past the gender issues of the time, I set up my own software house at one of the first such startups in Britain. But it was also a company of women, a company for women, an early social business. And people laughed at the very idea because software, at that time, was given away free with hardware. Nobody would buy software, certainly not from a woman. Although women were then coming out of the universities with decent degrees, there was a glass ceiling to our progress. And I’d hit that glass ceiling too often, and I wanted opportunities for women. Dame Shirley called herself ‘Steve’ to get a foot in the door (knowing that ‘Stephanie’ would put off potential [male] clients); she hired mothers who worked from home and trusted them to fulfil their business responsibilities – some very early and pioneering flexible and remote working. Throughout my Feminist Fact Friday I try to offer a few suggestions on what you can do with new-found knowledge, righteous anger or heartfelt inspiration. You can explore previous suggestions throughout the series, but here are some I think are especially relevant after you’ve listened to Dame Shirley’s TED Talk. My generation of women fought the battles for the right to work and the right for equal pay. 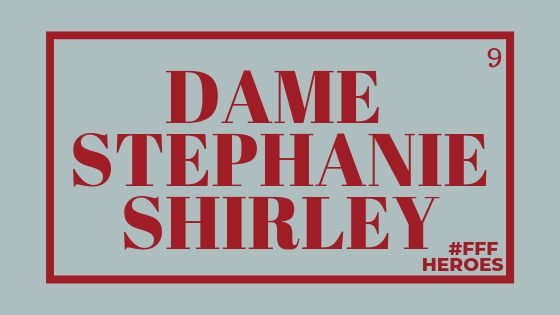 See Dame Shirley talking at an upcoming event on Monday 29 April in London how to: Academy presents… An Evening with Dame Stephanie Shirley CH on Women, Technology & Philanthropy. If it’s the tech world that has you fascinated then I’d recommend reading Emily Chang’s Brotopia: Breaking Up the Boys’ Club of Silicon Valley for insights into how the tech world developed and why it never had to be as unequal as it’s turned out to be. 73% work either part-time or with some form of flexible working arrangement […] Companies may not actively offer it as part of recruitment, but after six months in a job, every employee in the UK has the right to request flexible working. While companies aren’t obliged to acquiesce to a request, they are obliged to consider it “in a reasonable manner”. Related to the point on flexible working, think about how you might be able to adapt your workplace in ways that could bring a different group of people into your company. For example, “three-quarters of mothers have had a negative or possibly discriminatory experience during pregnancy, maternity leave or on their return to work from maternity leave” ^^ however, a (US) Federal Reserve paper “found that over the course of a 30-year career, mothers outperformed women without children at almost every stage of the game. In fact, mothers with at least two kids were the most productive of all.” So, what are you waiting for? Check out the amazing Creative Equals’ Returners Programme for a great example on how this can be done. Finally, go off and do something brave, something you’re scared of starting – no matter how small. It’s one thing to have an idea for an enterprise, but as many people in this room will know, making it happen is a very difficult thing and it demands extraordinary energy, self-belief and determination, the courage to risk family and home, and a 24/7 commitment that borders on the obsessive. So it’s just as well that I’m a workaholic. I believe in the beauty of work when we do it properly and in humility. Work is not just something I do when I’d rather be doing something else.